Built in 1904, a quaint B&B on the bluff. 475 guest rooms, many with Bay views. 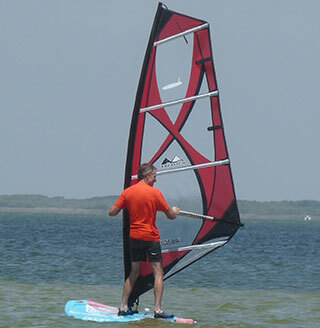 Situated along Bird Island Basin just inside the Padre Island National Seashore, WorldWinds Windsurfing provides expert windsurfing lessons in the shallow Laguna Madre waters for beginners and deeper waters for more advanced lessons. The tranquil secluded seashore, smooth warm waters, and steady breezes give Bird Island Basin at North Padre the distinction of being internationally known as a top destination for windsurfing. Our personal windsurfing instructor Olivier Jallais, with his rich French accent gave us encouraging instructions during our beginner class as we got used to our lightweight surfboard and sail rig. Olivier taught us the basics of balancing on the board, where to place our feet, hold our mast to let the wind catch our sail, and to turn around. Each lesson includes a rig ready to go with no assembly needed. As our beginner class was in shallow water (3 feet deep or less) with no waves, we had no need for foot straps or life jackets for our rig. The mast that controls the sails is connected to the surfboard at a rotating swivel base. I soon gained confidence at standing comfortably on the surfboard without falling off and steering the mast to best catch the 15 mph southeasterly wind with my sail. All classes include 1 hour of instruction with 2 hours of practice. A kids camp is also held three times each summer for kids 9-14 years old over a four day period, and was taking place while we were there. I noticed one 9 year old who was making us beginners look, well like beginners. Turning my rig was the tricky part, which was akin to slow dancing with the mast and sail while moving my feet on the board while the moderate breeze pushed me along. 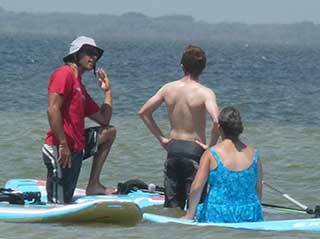 Windsurfing is a fun learning process the whole family will enjoy. As one gains experience they can learn to do some incredible jumps and upside down maneuvers over waves that are unmatched in any other sport. I talked with one veteran on the beach who said that he was still learning after twenty years. WorldWinds Windsurfing has a retail store that is stocked with a wide range of the latest for sale or rental including sailboards, masts, and windsurfing gear. 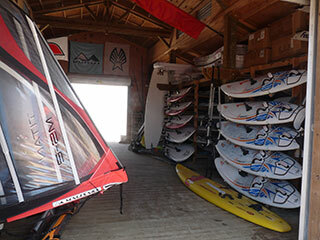 Brands include Maui, Fanatic, Starboard, Ezzy, Maui Sails, True Ames, Chinook and Maui Fin. Single and double kayaks are also available for sale and rental. After taking in some lessons at Worldwinds Windsurfing, you'll want hang around and explore the Padre Island Seashore beaches where you may see sea turtles or other wildlife. Nearby RV and tent spots are available by the beach within walking distance of Worldwinds Windsurfing (first come first serve basis, no hookups). WorldWinds also has condo rentals available that can be reserved via their website. 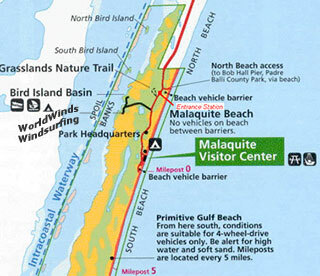 Admission to the Padre Island National Seashore is $10 per vehicle (valid for 7 days) or $20 per year. Just 1.5 miles inside the entrance to the North Padre Island National Seashore. Turn right onto Bird Island Basin Road and go 1/4 of a mile and you will arrive at the beach and WorldWinds Windsurfing. Take exit 1C for TX-286/Crosstown Expy and then merge onto TX-286 S after 3.9 miles. Exit TX-358 E (which becomes S. Padre Island Dr.) for 27.8 miles. After entering the North Padre Island entrance, go 1.5 miles then turn right onto Bird Island Basin Road for 1/4 of a mile. The prized flounder come into the shallows of the Bay after dark to feed.